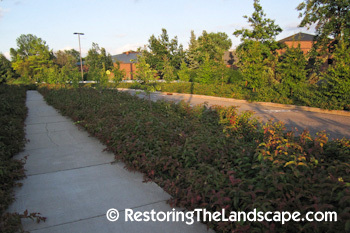 When it comes to landscaping with native plants, my municipality not only talks the talk but walks the walk. The landscaping around our City Hall complex which includes the police station, arena and park is professionally landscaped with natives. 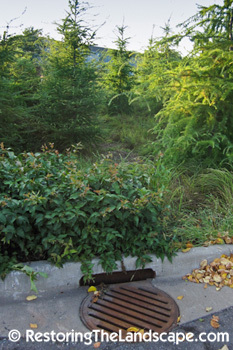 The divided road leading you into the complex is planted with Bush Honeysuckle (Diervilla lonicera), a low growing native shrub. Arising from this mass of Bush Honeysuckle are a mixture of native trees. 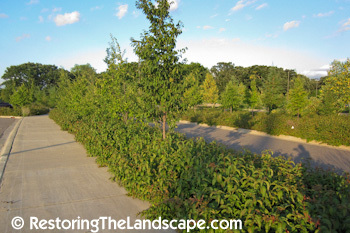 Closer to the entrance, the median is planted with Bur Oaks (Quercus macrocarpa), and further into the complex Ironwood (Ostrya virginiana) and Blue Beech Trees (Carpinus caroliniana) are also featured. 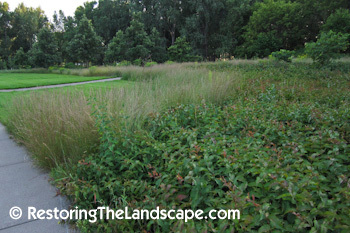 Prairie grasses (Little Bluestem and Side Oats Grama) are also massed and intermixed with the Bush Honeysuckle along the sidewalks showcasing a mix of textures and forms. 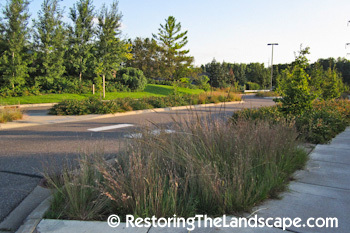 The parking lots are expertly designed to capture water runoff into deep swales. 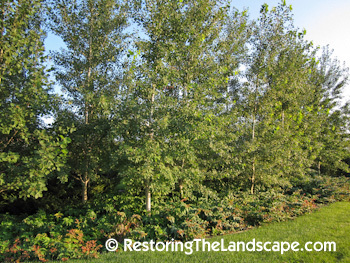 In the swales Tamarack (Larix laricina) and River Birch (Betula nigra) are the dominant tree species, as well as a mix of sedges. 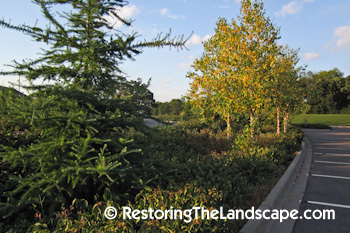 These trees help to shade the parking lots. A storm sewer located at the corner of the parking lot where water will flow into the swale behind. A drier berm planted with Bigtooth Aspens (Populus grandidentata) and Bush Honeysuckle with a small edging of grass. A large oak tree was preserved during construction and now has a boulder retaining wall around the front edge by the sidewalk. 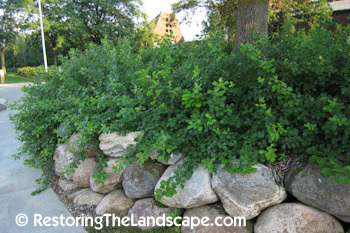 A nice use of Fragrant Sumac 'Gro Low' (Rhus aromatica) growing under the oak and cascading over the rock wall. 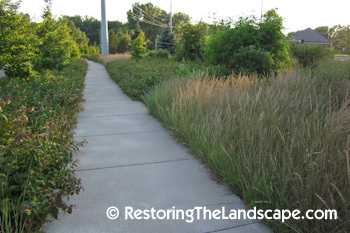 An attractive transition along a trail from lawn to native plantings bordered by prairie grasses and Bush Honeysuckle.